Seven days after seven tornadoes ripped through Grand Island on June 3, 1980, President Jimmy Carter came to survey the damage. 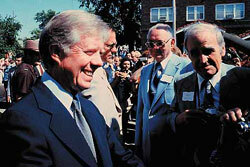 There was discussion among Grand Island residents that Carter's trip was to win votes in the 1980 presidential election. "Some people thought his visit was for show," John Brooks, 48, of Hastings, said. "But they didn't meet him." Brooks was a photographer for Channell 10/11 who covered Carter's visit to Grand Island. Charter was on his way back to Washington, D.C., from Seattle and stopped for about three hours. He gave several speeches commending people for their spirit and courage. He encouraged them to remain positive as they rebuilt the city. Most Grand Island residents who listened to Carter described him as sincere and pleasant, according to Independent stories from June 1980. Carter promised that the federal government would not abandon the residents of Grand Island. One of Carter's first stops was a meeting with local officials at the disaster assistance center set up in the Grand Generation Center. Then Hall County Supervisor Irene Abernethy, of Grand Island, listened to Carter's speech at the center and shook his hand in a receiving line. "He was nice," she said. After his speech, the president and his entourage were loaded into cars, vans and buses to tour the devastated area. The motorcade stopped on Bismark Road, and the first person Carter reached was Del Kosmicki, now of 651 Joehnck Road. Carter asked Kosmicki if he had any problems, and Kosmicki told him everyone one was working together. Kosmicki said his house was totaled by the storm, and he had been working on a neighbor's house when the president's motorcade arrived. "He was very genuine and sincere," Kosmicki said. "I thought he did a really good job and was polite." Kosmicki added that he remembered Carter's famous wide-toothed smile. After Carter spoke to Kosmicki, he walked across the street to where Gordy Scarborough's house had stood before the tornadoes struck, Kosmicki said. Carter stood on the foundation to talk to the crowd, Kosmicki said. Scarborough, who still lives in Grand Island, said he's the only civilian, in Nebraska at least, who's had a president speak from his home. Carter told the crowd on Bismark Road that God had blessed them by minimizing the damage done to some of the homes and blessed them all with unselfish attitudes, The Independent reported at the time. He told them they had been doing a fine job helping one another and encouraged them to keep the same attitudes. "I don't want you to feel alone. A lot of people are concerned about you," Carter said. "I and the (people) who work for me will be helping you right through to the end. Don't have any fear about us leaving you by yourselves." Brooks said he had been on his honeymoon in San Francisco when the tornadoes hit the city. He came back around June 7 to help report on the damage. Brooks said he had seen tornado damage before but was shocked at what he saw when he returned to Grand Island. Landmarks were gone, and nothing looked familiar. "It was devastating," he said. "Familiar things had been absolutely wiped out." Brooks was the local photographer selected to be part of the media pool that followed Carter through Grand Island. He taped the speeches and then shared the footage with other local channels. Being part of the pool of 70 to 80 members of the media allowed Brooks to have up-close access to Carter, he said. He said it was nice that Carter made time for the residents of Grand Island. He met with the victims and seemed concerned about them, Brooks said. "He was so personal and was a genuine man," Brooks said. Richard Dillman, 47, of Grand Island, was a reporter with KMMJ radio in 1980. He was also part of the media pool that traveled with Carter through town. Carter's visit reassured people that help was available, Dillman said. "He said he was only a phone call away," Dillman said of Carter. "That amused me." Dillman echoed Brooks' sentiments of the devastation in Grand Island. "Pier Park lost a lot of trees," Dillman said. "It was a beautiful, shady place, and it was just never the same after the storm. That really struck me." Dillman was in Spearfish, S.D., on vacation when the tornadoes hit. He said his house wasn't touched by the storm, so he worked overtime when he returned because some of the other reporters' homes were damaged. "I always wondered what I'd have been doing if I'd have been here," Dillman said. "I missed the story of the century for Grand Island."